Comet Over Hollywood is hosting it’s first ever contest in celebration of Turner Classic Movies finally honoring Joel McCrea as May’s Star of the Month. As my biggest heartthrob and favorite actor, I had to do something for Mr. McCrea, as well as thank all of you for your support of Comet. 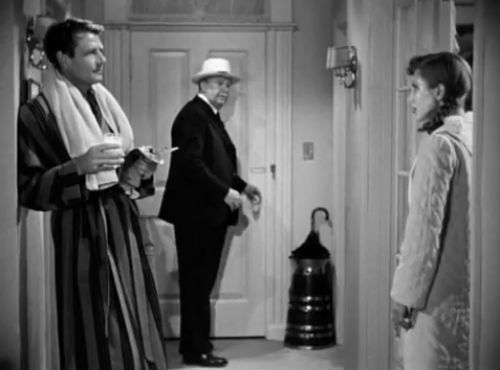 Jean Arthur realizes a strange man (Joel McCrea) is staying in her apartment with the permission of border, Charles Coburn in "More the Merrier" (1943). -The More the Merrier (1943): The World War 2 housing shortage comedy also starring Jean Arthur and Charles Coburn. 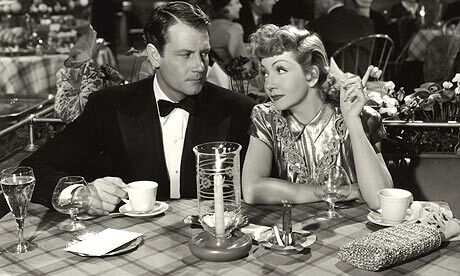 Joel McCrea and Claudette Colbert in "Palm Beach Story" (1942). -The Palm Beach Story (1942): McCrea’s wife Claudette Colbert divorces him in order to earn McCrea money from a millionaire in this Preston Sturges comedy. The movie also stars Mary Astor and Rudy Vallee. 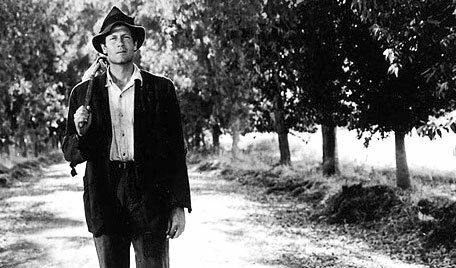 Screenwriter Joel McCrea lives as a hobo to see the other side in "Sullivans Travels" (1941). -Sullivan’s Travels (1941): McCrea is a screen play writer tired of writing fluffy comedies. He travels as a hobo for inspiration for a serious script; getting into trouble and risking his life. The film also stars Veronica Lake. The contest will be open from Tuesday, May 1, 2012, to Thursday, May 31, 2012. There will be three winners-each receiving one of these DVDs-announced in June. 1. What actress was married to Joel McCrea for 57 years? 2. What film did McCrea say was his personal favorite film he made? 3. What is the name of McCrea’s actor son? Name a movie he was in. 4. What actor did McCrea say he always received “leftover scripts” from, including his famous role in Hitchcock’s “Foreign Correspondent”? 5. What was the name of the movie where Joel McCrea played James Kildare (starting off the Lew Ayres series)? Good luck everyone and spread the word! Remember, email your answers to cometoverhollywood@gmail.com. This entry was posted in Comet Archives and tagged Joel McCrea, movie contest by Jnpickens. Bookmark the permalink. I’m not participating in the contest because I already own 2 out of the 3 movies, but I just want to say that I was so excited to see that Mr. McCrea is the star of the month for May. Although he’s not my favorite actor, I do love him alot. He’s adorable!! He definitely deserves to be recognized as a star of the month. The always amazing Comet Over Hollywood is giving away three of actor Joel McCrea’s most famous movies in honor of his appearance as Star of the Month on TCM. Answer five questions and one movie can be yours! Head over to Comet Over Hollywood to enter! Look for the hidden gem: Stars In My Crown on TCM in May, my favorite JM film.